Bus Éireann have announced improvements to the bus-service frequency on route 409 - Parkmore, effective from Sunday 3 April 2016. On Monday - Friday, between 7am and 7pm, there will be a bus every 12 minutes (on the hour an and at 12, 24, 36 and 48 minutes past. This is an increase from once every 15 minutes. On Saturdays, between 7am and 9am there will be a bus every 20 minutes (on the hour, 20 past and 20 to). This is a increase from once every 30 minutes. On Monday-Saturday in the evening, between 7pm and 11pm there will be a bus every 20 minutes (on the hour, 20 past and 20 to) This is a increase from once every 30 minutes. The last bus from Eyre Square will still be at 11:30pm. On Sundays, between 12-noon and 7pm there will be a bus every 20 minutes (on the hour, 20 past and 20 to) This is a increase from once every 30 minutes. On Sundays, between 7pm and 11:30pm there will be a bus every 30 minutes (on the hour and 30 minutes past) This is a increase from once every hour. There are no changes to the existing timetable during times not listed, ie Saturday 9am-7-pm and Sunday 9am - 12-noon. The Mon-Fri 6:30am service from Eyre Square to Parkmore via Ballybrit Industrial Estate (Boston Scientific) is unchanged. Easter 2016 is from Friday 25 - Monday 28 March. 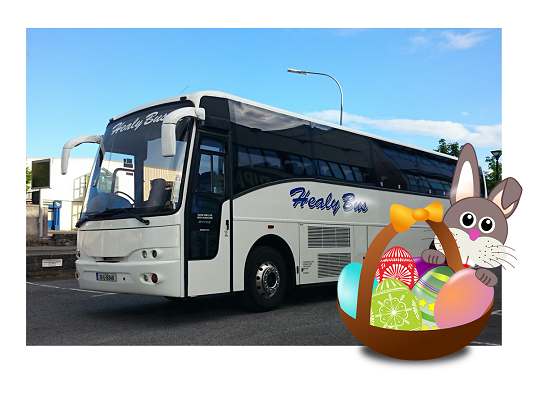 Good Friday (the 25th) is a bank holiday but not a public holiday in the Republic of Ireland: most public-transport run normal services, with a few exceptions. However all pubs, hotel bars and off-licenses are closed, all banks and many publc services (eg post-office) are closed, and some other companies treat the day as a "bank holiday". Most public transport services will run a Sunday timetable. No changes to services, but all buses on this route will be renumbered as Route 456. The 2:45pm service from Knock Airport (IWAK) to Westport will leave 15 minutes later. The Route 66 8:50am Westport to Ballina service will become a Route 456 journey. Journey times on some buses have been revised to reflect actual travel times more accurately.